Diamond Empire is a 3 reel and 15 payline slot that has a pretty simplistic theme and that has an Art Nouveau approach. This is a unique slot designed and developed by Microgaming and is perfect for the players looking for high winning potential and simple gameplay. The slot has been designed with utmost precision and is one of the very few slot games with 3 reels. The slot is mobile friendly and can be played at anytime and anywhere on the mobile as well as tablet devices. 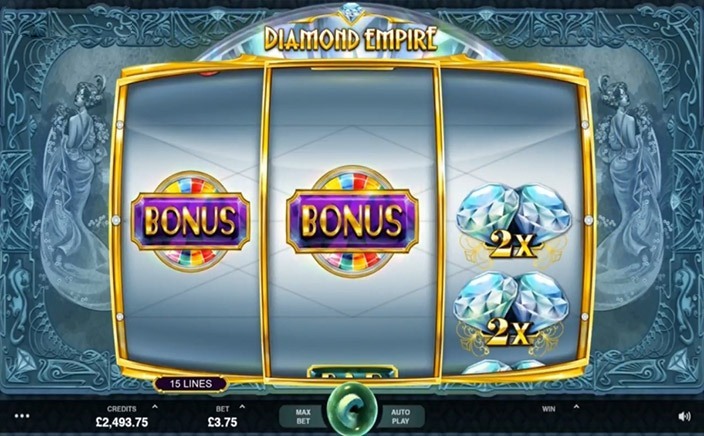 Diamond Empire is a simple looking slot game that has eye-catching graphics. Each of the reels is outlined with gold. The slot is in the shape of a real-time slot machine. You can adjust the size of the bet can be adjusted. The bet can range from 15p to £15 per spin. The symbols are also pretty simple looking. There are 5 regular symbols that include double bars, single bars, cherries, triple bars and sevens. Sevens is the highest paying symbol and can reward you up to 533x your bet. You can click on the AutoPlay feature to adjust the number of times you want the reels to spin automatically. The Spin button can be found in the lower middle portion of the screen. Clicking it will get the reels spinning. There are a few interesting bonuses and special symbol given to the players in Diamond Empire. The first special symbol is the wild. The 2x Diamond symbol as a wild and a multiplier symbol. It can substitute any symbol on the reel to make a winning combination except for the scatter. If you land two of these symbols together on the reels, the winning will be automatically multiplied with 2x. If your winning combination has two diamond symbols and one regular symbol, the winnings will be multiplied by 4x. If you are lucky enough to land the full screen filled with diamonds, you can win up to 10000 times your bet. The scatter is another bonus symbol. If you land three or more scatters on the reel, the bonus game will be activated. In this, you will get a chance to spin a wheel that rewards the player with multipliers. The highest multiplier is 888x. 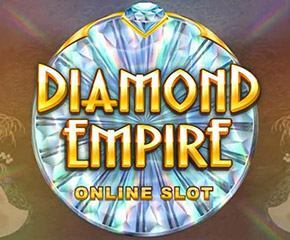 Diamond Empire is a simple yet high variance slot. This might not the best choice for the people looking for a lot of features and complex gameplay. But if you want to win big and enjoy a simple gameplay, this slot is the perfect pick for you.